I find myself feeling strangely uncomfortable when people call me a generalist and imagine that to be a compliment. My standard response is that I am actually an extremely narrow, hidebound specialist. I just look like a generalist because my path happens to cross many boundaries that are meaningful to others, but not to me. If you’ve been reading this blog for any length of time, you know the degree to which I keep returning to the same few narrow themes. I think I now understand the reason I reject the generalist label and resonate far more with the specialist label. The generalist/specialist distinction is an extrinsic coordinate system for mapping human potential. This system itself is breaking down, so we have to reconstruct whatever meaning the distinction had in intrinsic terms. When I chart my life course using such intrinsic notions, I end up clearly a (reconstructed) specialist. The keys to this reconstruction project are: the much-abused idea of 10,000 hours of deliberate practice, the notion of grit, and an approach to keeping track of your journey through life in terms of an intrinsic coordinate system. Think of it as replacing compass or GPS-based extrinsic navigation with accelerometer and gyroscope-based inertial navigation. I call the result “the calculus of grit.” It is my idea of an inertial navigation system for an age of anomie, where the external world has too little usable structure to navigate by. The generalist/specialist distinction constitutes an extrinsic coordinate system. We think of our environment as containing breadth and depth dimensions. The breadth dimension is chopped up by disciplinary boundaries (whether academic, trade-based or business-domain based), while the depth dimension is chopped up by markers of validated progressive achievement. What you get is a matrix of domains of endeavor: bounded loci within which you can sustain deepening practice of some skilled behavior. The boundedness is key. Mathematicians do not suddenly discover, in the 10th year of their practice, that they need advanced ballroom dancing skills to progress further. Ballroom dancers do not suddenly encounter a need for advanced aircraft engine maintenance skills after a few years of practice. Based on your strengths, you can place fairly safe bets early on about what you will/will not need to do if you make your home somewhere in the matrix. Or at least, you used to be able to. I’ll get to how these expectations from the twentieth century are breaking down. There is a social structure that conforms to these breadth/depth boundaries as well. A field of practitioners in each domain, stacked in a totem pole of increasing expertise, that legitimizes the work of individuals and provides the recognition needed for both pragmatic ends (degrees and such) and existential ends (“recognition” in the sense of say, Hegel). In his book Creativity, Mihaly Csikzentmihalyi made up exactly such a definition of extrinsically situated creativity as the behavior of an individual within a field/domain matrix. We are now breaking away from this model. Ironically, Csikzentmihalyi’s own work makes little sense within this model that he helped describe in codified ways; his work makes a lot more sense if you don’t attempt to situate it within his nominal home in psychology. Extrinsically situated creativity with reference to some global, absolute scheme of generalist/specialist dimensions is unworkable. At best we can hope for local, relative schemes and an idea of intrinsically situated individual lives. The problem with this generalist/specialist extrinsically situated creativity model is that the extrinsic frames of references are getting increasingly dynamic, chaotic and murky. To the point that the distinction is becoming useless. Nobody seems to know which way is up, which way is down, and which way is sideways. If you guess and get lucky, the answers may change next year, leaving you disoriented once more. The usual response to this environment is to invoke notions of multi-disciplinarity. Unfortunately, this is worse than useless. In the labor market for skilled capabilities, and particularly in academia, multi-disciplinarity is the equivalent of gerrymandering or secession on an already deeply messed-up political map. Instead of votes, you are grubbing for easily won markers of accomplishment. Its main purpose (in which it usually fails) is to create a new political balance of power rather than unleash human potential more effectively. The purpose is rarely to provide a context for previously difficult novice-to-master journeys. How do I know this? It’s patently obvious. If it takes 10,000 hours (K. Anders Ericsson’s now-famous threshold of deliberate practice, thanks to Gladwell, which translates to about 10 years typically) to acquire mastery in any usefully bounded domain, and you assume that there is at least one generation of pioneers who blazed that path to a new kind of mastery, what are you to make of fields that come and go like fruit flies in 2-3 years, in sync with business or funding cycles? The suspicious individual is right to suspect faddishness. I have come to the conclusion that if I cannot trace a coherent history of at least 20 years for something that claims the label “discipline,” it isn’t one. The problem with this though is that increasing amounts of valuable stuff is happening outside disciplines by this definition. It isn’t multi-disciplinary. It isn’t inter-disciplinary. It is simply non-disciplinary. It’s in the miscellaneous folder. It is so fluid that it resists extrinsic organization. So given that most excitement centers around short-lived fruitfly non-disciplines, how do people even manage to log 10,000 deliberate practice hours in any coherent journey to mastery? Can you jump across three or four fruit-fly domains over the course of a decade and still end up with mastery of something, even if you cannot define it? Yes. If you drop extrinsic frames of reference altogether. We are used to describing movement in terms of x, y and z coordinates, with respect to the Greenwich meridian, the Equator and sea level. Our sense of space is almost entirely based on such extrinsic coordinate systems (or landmarks within them). Things that we understand via spatial metaphors naturally tempt us into metaphoric coordinate systems like the depth/breadth one we just talked about. In academic domains, for instance, you could say the world is mapped with reference to an origin that represents a high-school graduate, with disciplinary majors and years of study forming the two axes that define further movement. Somewhere in graduate school, I encountered an idea that blew my mind: you can also describe movement entirely intrinsically. Actually, I had encountered this idea before, in vague popular science treatments of Einstein’s general theory of relativity, but learning the basics of the math is what truly blows your mind. The central idea is not hard to appreciate: imagine riding a complicated roller coaster and keeping track of how far along you are on the track, how you’ve been turning, and how you’ve been twisting. That much is easy. What is not easy is appreciating that that’s all you need. You can dispense with extrinsic coordinate systems entirely. Just keeping track of how those three variables (known as arc-length, curvature and torsion if my memory serves me) are changing, is enough. For short periods, you can roughly measure them using just your intrinsic sense of time and how your stomach and ears feel. To keep the measurements precise over longer periods, you need a gyroscope, an accelerometer and a watch. If you want motifs for the two modes of operation, think of it as the difference between a magnetic compass and a gyroscope (these days, GPS might be a better motif for the former, but the phrase “the compass and the gyroscope” has a certain ring to it that I like). We need another supporting notion before we can construct an intrinsic coordinate system for human lives. Remember that the primary real value of an extrinsically defined discipline in a field/domain matrix is predictable boundedness. Mathematicians can trust that they won’t have to suddenly start dancing halfway through their career to progress further. This predictability allows you to form reasonable expectations for decades of investment, and make decisions based on your upfront assessment of your strengths, and expectations about how those strengths will evolve as you age. If I decide that I have certain strengths in mathematics and that I want to bet on those strengths for a decade, to get to mastery, I shouldn’t suddenly stumble into a serious weakness along the way that blocks me, like a lack of natural athleticism. So a disciplinary boundary is very useful if it provides that kind of predictability. I call this behavioral boundedness. An expectation that your expected behaviors in the future won’t wander too far out of certain strengths-based comfort zones you can guess at fairly accurately, upfront. Before putting in 10,000 hours. What happens when that sort of predictability breaks down? It is certainly happening all over the place. For instance, I didn’t realize I lacked the strengths needed for a typical career in aerospace engineering (the sort high-school kids fantasize about when they first get interested in airplanes and rockets) until well into a PhD program in the subject. Fortunately, I was able to pivot and head in another direction with almost no wasted effort. Few people are that lucky. There are domains where the boundedness is very weak indeed. The upfront visible boundedness is a complete illusion. Marketing is one such domain. You might get into it because you love creative messaging or talking to people. You may discover the idea of positioning two years into the journey and realize that creativity in messaging is a sideshow, and the real job is somewhat tedious analysis of the mental models of prospects. A further two years down the road, you may discover that to level-up your game once more, you need to become a serious quantitative analytics ninja and database geek. This can also work out in positive ways. You might wake up one fine day and realize that your life, which makes no sense in nominal terms, actually adds up to expertise in some domain you’d never identified with at all. That actually happened to me with respect to marketing. On paper, I am the opposite of a marketer. I have a PhD in aerospace engineering, am introverted, and write in long-winded and opaque ways rather than in catchy sound-bytes. Nevertheless, at some point I realized with a shock that I had accidentally logged several thousand hours along a marketing career path without realizing it. I had just completely misunderstood what “marketing” meant based on the popular image the field presents to novices. When I went free-agent a few months ago, most of my consulting leads I had coming in had to do with marketing work. This did not surprise me, but it certainly surprised my father and several close friends, who assumed I was doing some sort of technical consulting work around computational modeling and scientific computing. I’d never thought of myself as a marketer. A computational modeler, yes. A hustler perhaps. A fairly effective corporate guerrilla, yes. A marketer, not really. I viewed my previous marketing work as the work of a curious tourist in a strange land. I viewed my marketing writing as outsider-anthropology amongst strange creatures. But apparently, that’s not how others view me. Looking back, and trying to make sense of my life in retrospect as “the training of an accidental marketer,” it makes sense though: I’ve logged the right mix of complementary experiences. Marketing is still not my primary identity though (that would mean returning to a Procrustean bed of disciplinary identity). Many people luck out like me, accidentally. We recognize what particular path to mastery we’re on, long after we actually get on it. Many do not. They bum around in angsty anomie, craving structure where none exists, and realizing after a decade of wandering that they’ve unfortunately gotten nowhere. Is it possible to systematically do things to put yourself on a path to mastery, and know you’re on one, without actually knowing what that path is until you’re already far down it? If there is no external frame of reference, how do you know where you are, where you are going and whether you are progressing at all, as opposed to bumming around? Can you log any old time-sheet of 10,000 hours, slap a label on it, and claim mastery? Thankfully, intrinsic navigation is not quite that trite. A clue to the mystery is the personality trait known as grit, probably the best predictor of success in the modern world. I used to believe this understanding of grit as a superhuman trait. I used to think I didn’t possess it. Yet people seem to think I exhibit it in some departments. Like reading and writing. They are aghast at the amount of reading I do. They wonder how I can keep churning out thousands of words, week after week, year after year, with no guarantee that any particular piece of writing will be well-received. They think I must possess superhuman willpower because they make a very simple projection error: they think it is hard for me because it would be hard for them. Well of course things are going to take superhuman willpower if you go after them with the wrong strengths. For a while, I went around calling this faux-grit. The appearance of toughness. But the more I looked around me at other people who seemed to display grit in other domains, the more I realized that it wasn’t hard for them either. What they did would merely be superhuman effort for me. Faux grit and true grit are the same thing (the movie True Grit is actually quite a decent showcase of the trait; it showcases the superhuman outside/fluid inside phenomenon quite well). So what does the inside view of grit look like? I took a shot at describing the subjective feel in my last post on the Tempo blog. It simply feels like mindful learning across a series of increasingly demanding episodes that build on the same strengths. But the subjective feel of grit is not my concern here. I am interested in objective, intrinsically measurable aspects of grit that can serve as an internal inertial navigation system; a gyroscope rather than GPS. In physical space, latitude, longitude and altitude get replaced by arc-length, curvature and torsion when you go intrinsic. In endeavor space, field, domain and years of experience get replaced by three variables that lend themselves to a convenient new 3Rs acronym: reworking, referencing, releasing (well, technically, it is internal referencing and early-and-frequent releasing, but let’s keep the phrase short and alliterative). I believe the new 3Rs are as important to adults as the old ones (Reading, wRiting and aRithmetic) are for kids. I stumbled upon rework as a key variable when I tried to answer a question on Quora: what are some tips for advanced writers? Since writing is something everybody does, logging 10,000 writing hours is something anyone can do. My aha! moment came when I realized that it isn’t the writing hours that count, it is the rewriting hours. Everybody writes. People who are trying to walk the path towards mastery rewrite. I won’t say more about this variable. If you want a worked example, read my Quora answer. If you want a quick and pleasant read on the subject, Jason Fried’s Rework gets at some of the essential themes (though perhaps in a slightly gimmicky way). For referencing, my clue was my recent discovery that new readers of this blog often dive deep into the archives and read nearly everything I’ve written in the last four years. I dubbed it the ribbonfarm absurdity marathon because I didn’t understand what would possess anyone to undertake it. But then I realized that I write in ways that practically demand this reading behavior if people really want to get the most value out of what I am talking about: I reference my own previous posts a lot. Not to tempt people into reading related content, but out of sheer laziness. I don’t like repeating arguments, definitions or key ideas. So I back-link. I do like most of my posts to be stand-alone and comprehensible to a new reader though, so I try to write in such a way that you can get value out of reading a post by itself, but significantly more value if you’ve read what I’ve written before. For example, merely knowing what I mean by the word legibility, which I use a lot, can increase what you get out of some posts by 50%. This is one reason blogging is such a natural medium for me. The possibilities of hyperlinking make it easy to do what would be extremely tedious with paper publishing. The key here is internal referencing. I use far fewer external reference points (there’s perhaps a dozen key texts and a dozen papers that I reference all the time). It sounds narcissistic, but if you’re not referencing your own work at least 10 times as often as you’re referencing others, you’re in trouble in the intrinsic navigation world. Instead of developing your own internal momentum and inertia, you are being buffeted by external forces, like a grain of pollen being subjected to the forces of Brownian motion. And finally, releasing. As in the agile software dictum of release early and often. In blogging, frequency isn’t about bug-fixing or collaboration. It isn’t even about market testing (none of my posts are explicitly engineered to test hypotheses about what kind of writing will do well). It is purely about rational gambling in the dollar-cost averaging sense. It is the investing advice “don’t try to time the market” applied to your personal work. If the environment is so murky and chaotic that you cannot strategically figure out clever moves and timing, the next best thing you can do is just periodically release bits of your developing work in the form of gambles in the external world. I think there’s a justifiable leap of faith here: if you are work admits significant reworking and internally-referencing, you’re probably on to something that is of value to others. If a post happens to say the right thing at the right time, it will go viral. If not, it won’t. All I need to do is to keep releasing. This realization incidentally, has changed my understanding of phenomena like iteration in lean startups and serial entrepreneurs who succeed on their fifth attempt. It’s mostly about averaging across risk/opportunity exposure events, in an environment that you cannot model well. I am pretty sure you can apply this model beyond blogging and entrepreneurship, but I’ll leave you to figure it out. These three variables together can measure your progress along any path to mastery. What’s more, they can be measured intrinsically, without reference to any external map of disciplinary boundaries. All you have to do is to look for an area in your life where a lot of rework is naturally happening, maintain an adequate density of internal referencing to your own past work in that area, and release often enough that you can forget about timing the market for your ouput. What does navigating by these three variables look like from the outside? If you only do a lot of internal referencing, that’s like marching along a straight, level road. If you do a lot of internal referencing and a lot of rework, that’s like marching along a steady uphill road that’s gradually getting steeper from an external point of view (in other words, you are on your own exponential path of progress). What you are doing will look impossible to observers. It may look like you are marching up a vertical cliff. A great example is the Silicon Valley archetype of the 10x engineer. And finally, if you are releasing frequently, that’s like turning and twisting: spiraling around an increasingly steep mountain (or zig-zagging up via a series of switchbacks). Navigating with the 3Rs as an adult isn’t enough. You still have to recover the value the old disciplinary model provided: behavioral boundedness. Whether you are navigating intrinsically or extrinsically, suddenly running into a mountain — a major weakness — is just as bad. The key here is very simple and very Sun Tzu: with respect to the external world, take the path of least resistance. Why? Think of it this way. The disciplinary world very coarsely measured your aptitudes and strengths once in your lifetime, pointed you in a roughly right direction and said “Go!” The external environment had been turned into a giant obstacle course designed around a coarse global mapping of everybody’s strengths. So there was no distinction between the map of the external world you were navigating, and the map of your internal strengths. The two had been arranged to synchronize. If you navigated through a map of external achievement, landmarks and honors, you’d automatically be navigating safely through the landscape of your internal strengths. But when you cannot trust that you’ve been pointed in the right direction in a landscape designed around your strengths, you cannot afford to navigate based on a one-time coarse mapping of your own strengths at age 18. If you run into an obstacle, it is far more likely that it represents a weakness rather than a meaningful real-world challenge to be overcome, as a learning experience. Don’t try to go over or through. It makes far more sense to go around. Hack and work around. Don’t persevere out of a foolhardy superhuman sense of valor. If it isn’t crystal clear, I am advocating the view that if you find that what you are doing is ridiculously hard for you, it is the wrong thing for you to be doing. I maintain that you should not have to work significantly harder or faster to succeed today than you had to 50 years ago. A little harder perhaps. Mainly, you just have to drop external frames of reference and trust your internal navigation on a landscape of your own strengths. It may look like superhuman grit to an outsider, but if it feels like that inside to you, you’re doing something wrong. Why now? It starts with the fact that globalization and the information technology revolution have gone to a whole new level. Thanks to cloud computing, robotics, 3G wireless connectivity, Skype, Facebook, Google, LinkedIn, Twitter, the iPad, and cheap Internet-enabled smartphones, the world has gone from connected to hyper-connected. The environment that really matters isn’t the external world. It is pretty much pure noise. You can easily find and process the subset that is meaningful for your life. It isn’t about harder, smarter, faster. If it were, I’d be dead. I’ve been getting lazier, dumber and slower. It’s called aging. I think Friedman is going to run out of superlatives like “hyper-” before I run out of life. If I am wrong, the world is going to collapse before he gets around to writing The World is Hyper-Flatter-er. Humans are simply not as capable as Friedman’s survival formula requires them to be. Exhortation is pointless. Humans don’t suddenly become super-human just because the environment suddenly seems to demand superhuman behavior for survival. Those who attempt this kill themselves just as surely as those dumb kids who watch a superman movie and jump off buildings hoping to fly. It is the landscape of your own strengths that matters. And you can set your own, completely human pace through it. The only truly new behavior you need is increased introspection. And yes, this will advantage some people over others. To avoid running faster and faster until you die of exhaustion, you need to develop an increasingly refined understanding of this landscape as you progress. You twist and turn as you walk (not run) primarily to find the path of least resistance on the landscape of your strengths. If you’re paying attention to the Chinese kids who score a perfect 800, you’re paying attention to the wrong people. I mean, really? You should worry about some Chinese kid terrorized into achieving a perfect-800 math score by some Tiger Mom, and applying to Grinnell College? It’s the Chinese kids who are rebelling against their Tiger Moms, completely ignoring the SAT, and flowing down the path of least resistance that you should be worried about. After all Sun Tzu invented that whole idea. So rework, reference, release. Flow through the landscape of your own strengths and weaknesses. Count to 10,000 rework hours as you walk. If you aren’t seeing accelerating external results by hour 3300, stop and introspect. That is the calculus of grit. It’s the exponential human psychology you need for exponential times. Ignore everything else. Factoid: this entire 4000-plus word article is a working out of a 21-word footnote on page 89 of Tempo. That’s how internally-referenced my writing has become. Never say I don’t eat my own dogfood. Don’t forget your juggling. That’s pretty much a perfect illustration of 10,000 hours and the 3Rs :) Seems to have had a very strong interplay with your math too. Hm. Y’know I never thought about it, but I’m estimating it was closer to 3,000 hours around the point that I really started to cut back (largely because I hadn’t improved in years). Anyway point taken. Fantastic post! Great read. Thanks for sharing. There is a polymath in every person. People don’t make notes and blog about their subjects of interest. 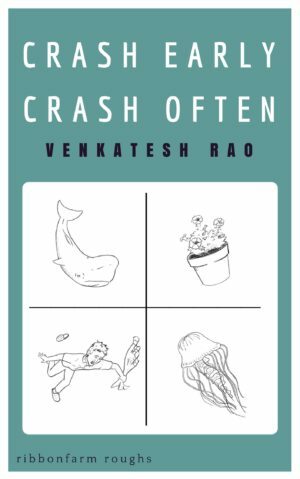 For what it’s worth, I think this is one of your best posts ever, especially in terms of finding a good Venkat-ish metaphor and doing something useful with it. Glad I am evolving in the 3Rs and developing this approach to exploring ideas :P.
Yeah, I’ve done enough of this particular trick by now that I am starting to identify key principles in how to explore ideas using metaphors as a starting point. Venkat: if it’s not already happened then I suspect that at some point, depending on the sort of company you keep, someone will want to bend your ear about 20th century French philosophy, specifically the work of Deleuze and Guattari. If so, the relevant thing here is the chapter “1440: The Smooth and the Striated” from “A Thousand Plateaus” is . This isn’t either a recommendation or dis-recommendation, but forewarned is forearmed and all that sort of thing. Good point. I didn’t adequately think through a non-featureless way of thinking about navigation (other than in the sense of your landscape of strengths having features). I think you are right: an external landscape to error-correct dead-reckoning is fundamentally different from an extrinsic situation of movement itself. I’ll have to work through the idea. And yes, several people have already put Deleuze and Guattari on my radar (including the smooth/striated distinction). So far though, I haven’t seen people mention distinctive ideas from them that I haven’t already encountered from other sources. The main value they add seems to be in creating a more subtle language. I may get to D&G at some point, but they are pretty far down my priority list at this point, unless someone can point out truly novel things they say (outside of linguistic innovations) that others haven’t said. I agree with you that the right coordinate system to use is a practical matter. It depends on the so to speak. For example, surface ships use GPS. Submarines use gyroscopes. On the other hand, technology is changing the economic landscape. Software in particular is changing the very nature of the landscape. What coordinate system is best if we can’t predict how the landscape will change? If you don’t know if you will wind up above or below water, so to speak? For someone believing that intrinsic motivation  is much more important than extrinsic motivation I truly liked this article. I think that intrinsic systems will always require some additional skill for not getting lost in such spaces. I would prefer generalizing the 3R to “KFTF and picking up TEMPO” [2,3]. KFTF will provide the mass (knowledge,PIM,personal information management) and the TEMPO skill will determine the balance between direction changing agility and speed. I say on purpose ‘direction changing agility and speed’. We know from grit and overrated talent  that some people simply might not see another way around hurdles, because they do not work on the combination of changing agility and speed. Some people might only work on being agile (not having endurance), some others only on having constant speed in one direction (not caring about agility). I strongly believe that certain pathfinder skills are critical for making use of “KFTF and picking up TEMPO”. Only when people have such skills they might be able keeping on track (preventing exhausting hurdles) and for self-positioning them in an instrinsic and extrinsic coordinate system. We could consider such skills as GPS(me), and I would believe that each individual is stronger in some pathfinder areas than others, which is the reason I called it ‘(me)’. Joerg — can you elaborate on KFTF? I haven’t heard of it or read it. Perhaps a short elevator pitch explanation? KFTF elaborates in a very pragmatic way (supported by a lot of scientific evidence) different knowledge management principles people need in their daily life; like finding information, making sense out of information, storing resulting information, and re-finding information. It also covers personality types and different needs. So what you call “re-working (re-writing)” I would generalize as personal information management (PIM), aka learning and keeping it, which is the key topic of the book. Thanks for this post, along with your Quora answer it’s made me think about my own efforts as a writer. At first I was finding it had to see the universality of your “Rework” “R.” I wondered how it would fit something like, say, a karate kata, where your goal is not like a rewrite because you’re trying to make specifically a certain way, as opposed to developing and changing it. But I think what you’re getting at is deliberate practice. I never read Gladwell’s book, but Anders Ericsson wouldn’t agree that writing emails and shopping lists counted towards that 10,000 in writing either. It’s not 10,000 hours of activity, it’s 10,000 hours of deliberate practice. So yes, rewriting, would be one. In guitar, it would be working on that scale or solo that you can’t quite nail yet, while a few hours spent jamming to songs you’ve already mastered wouldn’t count. Can you give some examples of how internal referencing would work in areas outside of writing? It’s easy to see in a hyperlinked blog, but how about as a data analyst, a martial artist, or a carpenter? I am thinking I should replace “reference” with “reuse” (your own previous work). Programmers use their favorite design tricks over and over. A carpenter might develop a few efficiency tricks and reuse them. An artist might reuse old artistic insights in new work (Amy Lin’s art, which I’ve written about before, has always been about patterns of dots, but has gotten more complex over time). In our educational and economic climate the likelihood that someone will develop their internal guidance system seems ridiculously small. Consider that the most crucial time for this development would be when someone is in their youth and almost everything about youth culture/obligations (say age 16-25) tends to steer away from thought, let alone introspection. For me, it wasn’t until I went through severe emotional trauma and came under care of an excellent psychologist through the free counseling services at my university that self talk truly entered into my field of awareness. God help you if you are already laden with mortgage payments and a family to provide for before you hit that beginning point required for effective disciplinary navigation. Even if you then go on to figure out your strengths, social and financial ties might be enough to warp your perceptions of the true long term path of least resistance. This maybe why its so enamoring for people to see someone whose system is fully operational even if they can intellectually identify with what you are saying. Side note of interest: the most popular youth cartoon series out of Japan right now is called Naruto, and is a massive international success. The message is precisely the opposite of yours: hard work in the face of anything will overcome anything. The protagonist’s strongest weapon is something he was shown to have pure innate deficiency accomplishing, so he threw thousands of hours of practice at it. Haha, you’re an inter-generational contrarian. So a disciplinary boundary is very useful if it provides that kind of predictability. I call this behavioral boundedness. An expectation that your expected behaviors in the future won’t wander too far out of certain strengths-based comfort zones you can guess at fairly accurately, upfront. True, but that’s not why they do exist in the first place. Also etymologically “disciplinary” boundaries have always been only tangential to research but not for canonization of teaching and forming disciples in a certain way – the primary reason why universities exist. I hardly believe this becomes irrelevant just because people have blogs now and a small percentage of them use it to explore new ideas. I’ve also noticed that you are wading through Deleuzian territory ( nomadism, marked vs smooth space etc. ) but Deleuze is dark, “poetic” ( or obscure, dependent on whether you like his language ), metaphysical etc. and all of this might add very little to the basic (platonic) ideas. I believe he was heading towards something different though like all the later revered and hatred “postmodern” French writers of his time: using an anomic language which is complicit with a desired post-bourgeois society. The language itself becomes “deterritorialized”, nomadic, rhizomatic, “a plane of immanence” and so on – without any technical crutches. It is a totality and the thinker qua writer dissolves the boundaries between form and content. It could happen to work within philosophy because it is a discipline rejecting disciplinary boundaries ( but not its own traditions ) following the arts more closely than the sciences. Thank you for this article. 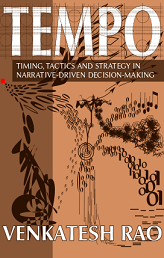 I got “Tempo” at Hosh Hsiao’s recommendation a few weeks ago and read it then I think I became one of your marathon readers. This article has resonated more with me than anything else you’ve written. I’m on my third business venture and loving all of it. It seems like this one has a greater chance of success than the others, but I have a blooming joy about what I’m doing (building electronic synthesizers) that I feel like an idiot when I tell people I hardly care if I succeed or fail. I’m also planning a coffee shop with my girlfriend and to get her started in imports and exports and maybe get her to combine business with my best friend back in the USA. But the best compliment I can give you is that I recommended this article to my little sister, who I think is getting discouraged by the gloom and doom of the Friedman’s and the Alex Jones’s of the world… I wasn’t able to really explain to her what it is I’m doing with my life, or how I know I’ll be doing just fine in ten years, until I read this. My parents think I’m just tough as nails, I suspect, and my extended family and a lot of the people around me think I’m raving crazy, but your article really helps ME understand MYSELF better… So I recommended it to her. Glad to have you on board Jiao! I love how this post and your History of Corporations post go hand-in-hand. Grit, and the path of least resistance you describe, are how one gets to a unique perspective. Internal referencing is a very legible form of self-reliance; it is that situation when you find that you have made the most useful tool for yourself, often from other people’s. It’s a kind of cognitive import-substitution, just as you can look at those people who you most often get ideas from, you can distinguish between those whom you quickly transform into your own recorded ideas, notes and posts, and those whom you find valuable but just mull over and re-read what they say. Something you might want to be aware of though; Marxists have this wonky view of investment where they say it causes exploitation by forcing people to work to sustain it. But putting that in more helpful words, once you have invested in a procedure, you can continue to function in ways based on that procedure to maximise your return on a previous investment, /regardless of it’s benefit to you or others/. Bringing that together with the above, you can start by looking at those places where you’ve built up a lot of internal referencing previously; which persistently turn out to be useful and make problem solving straightforward, and where what is hard “for the average person” has become easy for you, because of your previous build-up of experience and concept building. The first problem is easy to solve; it’s where you get so into internal referencing, elaborating on existing tools, finding new applications and so on, that you stop adding new ideas to the pot, making the structure slowly more and more fragile, but you already get that I’m sure, given your interest in wild thought. The second problem comes when taking advantage of it shifts the structure of your life sufficiently as to take you out of the rhythm and surroundings you need to actually enjoy it; speeding you up to much, taking you out of contact with certain kinds of people, or putting you into too much contact with other kinds of people. Basically you’re skills start to imply a lifestyle un-conducive to your personality. Solving that is pretty straightforward, just avoid allocating up all your time in advance, so that even if you start finding yourself being effective at organising security at mass teen-pop shows, you still have time for long walks and chats with weird people. Obviously time’s not the only shared resource or point of mutual constraint, but it stands for a lot of others. The third problem is in getting so associated with certain ideas and approaches that people collapse their model of you down to certain kinds of problems (or worse, politics), and you effectively get “typecast” for certain jobs that are pre-diagnosed to suit you and “your methods”, even if on further inspection they don’t actually suit either. Not really sure how to solve that, apart from suggesting that if you find yourself being drawn to the CIA, that’s probably going to influence you’re ability to work with people in other countries! Other than that it’s possible that you want to keep a little bit of noise in your marketing identity, so people still wonder if stuff will suit you and seek your input more. But in short, don’t be a slave to your toolchain! You might enjoy essay linked below, titled “The Age of the Essay” – related but somewhat tangent from this blog post. Enjoy. I started reading Emerson’s Self Reliance on the same plane ride as I read this post — he writes “Your genuine action will explain itself, and will explain your other genuine actions,” which reminded me of your relative coordinates. Also, John Cook has a recent post on kind of the same theme (“The same person could be a dilettante or a specialist depending on your mental categories”). Venkat – this posting invoked much resonance of ideas for me. Thank you. In particular, I think the section “What does navigating by these three variables look like from the outside?” also brings a warning: From the viewpoint of the outside observer the passage of one’s intrinsic path can appear to be a “crash and burn” equally easily – it all depends on the moment and angle from which it is perceived. Also if society, culture, economy and science (belief) are on their intrinsic paths how does one “flock” so as to stay with them? It would seem we need a mechanism more than random and frequent emitting of our position. We need – like the bat – to be able to read the echoes, and adapt accordingly. Outstanding post and insight! Venkat, you may be interested in checking out a presentation and blog post of mine about the buzzword “Data Science”. I cited you and this post while arguing that “Data Scientist” is a new and newly-recognized career path. I take your point about the Frenet formulae. But it doesn’t make sense to say two dimensions are years and major. Each major corresponds to a dimension in some (perhaps inappropriate, perhaps affine / nonlinear) coordinate system and time spent in that college major increases the vector’s length in that dimension (as it travels in time). I don’t get how that directly relates to creativity. Also can we be a little more precise about extrinsic coordinate systems in general? I would say that many people (e.g. hiring managers) have (at least one) coordinate system in their head, which corresponds to how they evaluate others. For example academics (I think I found your post via John D Cook) tend to divide the world up along the lines of college disciplines. Something like cognitive science transgresses the boundaries, yes — but, how does that relate to one’s personal development? I don’t think the “multidisciplinarity” of artificial life or something trendy like that has much to do with extrinsic vs intrinsic coordinate systems. I view these “fads” as attempts at originality which don’t end up impressing people very much. Except that they sometimes can, later. One last point: a vector’s path gamma(t) can surely wind around in circles, doing nothing useful. Are you intending to imply that with your Frenet-frame view? OK Venkat, I thought of four more problems with describing this as merely change-of-basis. 1) You’re starting too late if the origin is at age 18. (You seem uncommitted to that origin though.) There are plenty of opportunities that are closer to that origin than they are to having a Ph.D. in biochemistry. And moreover at age 18 one is more easily able to redirect oneself — a property that’s not built into the space as stated. 2) Although different hiring managers’ perceptions play a role, in some sense the (Frenet-frame) journey through whatever space we’re talking about (professional space?) is more about getting to *regions* — which are independent of someone’s perception. If journey straight ahead from the origin in the unwavering direction of 13th century French monastic scholarship, there are no demands for that skillset for a long time (although at some magnitude there is a professorship). That the skills learnt on that path may be repurposed to some corporate end, seems unrelated to either change of basis or region — it feels more like a Wormhole. 3) There’s no comparative advantage in this model. If I’m close to zero opportunities, I have much less to lose and therefore would make a much better drug-runner. That’s just one example; someone with programming skills might think they shouldn’t pursue HVAC even if that’s where the money is going to be. 4) Likewise there’s no supply-and-demand. If all the other rocket scientists are pointing their career-rockets toward quantitative finance, that should be seen as more gamma(t)’s entering that Region. Interesting analysis, to add to the generalist/specialist distinction, I would like to hear your thoughts on the metaphor of T-shaped professionals? Also it would be inspiring to see how we can use the amateur/professional distinction in this new surrounding (from a point of view of being accidental/substandard/unreliable vs. being a professional/expert/accountable, because it is much harder or even near to impossible to know what the standard is). I’ve never actually met a convincing T-shaped professional to be frank. The theory is great on paper, but I think the psychology is more complex than that. Amateur/professional though, is a far more interesting distinction because it brings in social and legal aspects as well. I’ve been mulling that for a while, and have not reached any interesting conclusions yet. In light of this post, the vast number of successful writers with a graduate degree might be explained not by a correlation between those who are compelled to go to grad school and those interested in writing but by the fact that a Phd is four years of nothing but reworking, self-referencing, and releasing. I have not started (officially) writing my thesis yet, and already I have spent so much time rewriting (side note – I think reworking encourages self-referencing) and re-reading my ideas that I get the impression I cannot explain my research to anyone outside my adviser. I reference myself too much. in Germany there is tale called “The Rabbit and the Hedgehog” which is about the two of them conducting a race and due some trick the hedgehog always seems to already be were the rabbit arrives. That’s what I guess it sometimes has to look like to outsiders when you move comfortably around your own map. On the other hand, the rework and reference part can look like failure to some when you suddenly change you mind or solution to problem “mid-way through”. And if you have the bad luck to work in an environment that doesn’t tolerate this, you are screwed. This is what my mom was trying to say to me the other day. She was going on about how she didn’t understand where along the line I became as calm, strong, and supportive as I was. I essentially told her that all it took was being knocked down so hard that my image of myself broke. The process of getting up made me realize that I could take all of the pieces of me and a plated glass collage for the light to shine through. After that everything else has been fun and games. Sadness is a lesson, obstacles are for climbing, and happiness can be found by splashing about in mud puddles.